The little village of Brough lies on the road to Dunnet Head, the most northerly point on the British mainland. 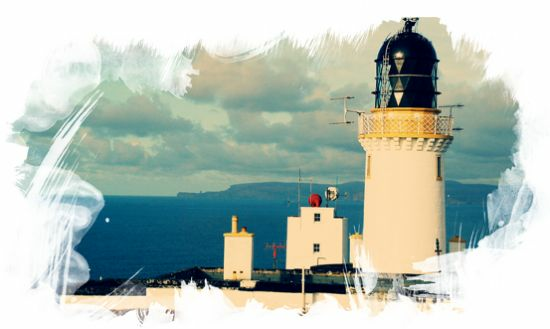 It is a natural lookout over the Pentland Firth, with the cliffs rising to 100 metres above sea level, and then the whitewashed tower of the lighthouse built by Robert Stevenson in 1831. You look across the Pentland Firth to Orkney, as if on the other bank of a river, and indeed when the tide flows strongly, this is what it feels like. There are two separate tidal systems around Orkney, one in the North Atlantic and the other in the North Sea. The two tidal streams have similar strengths but come from different directions and arrive at different times. The Atlantic peak comes in about three hours ahead of the North Sea. The tidal flow swirls around the small islands in the Firth and some of the flow of water can turn into counter-currents or sometimes whirlpools, as with the Swelkie off the island of Stroma, powerful enough to turn a ship around. The Merry Men of Mey are formed by a wall of water running from the island of Hoy to a point on the Caithness shore, with breaking waves rising high in the air – ‘a natural breakwater’ says the North Coast of Scotland Pilot. The force of the tides comes from the moon’s gravitational pull on the earth, and the underlying theory of the tides was first formulated by Sir Isaac Newton, as a practical consequence of his theory of gravity, which he published in 1689. Some of the earliest supporters of Newton were Scottish mathematicians, among them Colin Maclaurin, professor of mathematics at Edinburgh University and highly gifted in geometry. At this time, losses of shipping on the east-west sailing route past Orkney were causing concern internationally. Whether their course was through the Pentland Firth itself or to by the north of Orkney, shipwrecks were mounting up, and in 1740 the Earl of Morton took the lead in seeking action. He had lands in Orkney and also a strong interest in science; he later became president of the Royal Society. It was clear that really accurate set of charts were needed, and Maclaurin, with his skills in geometry and his knowledge of tidal factors, seemed to be the man. But the scale of the commitment was too big; and Maclaurin recommended instead an Orcadian who was already working in his native islands – Murdoch Mackenzie, a master at Kirkwall Grammar School and almost certainly one of his former students. Mackenzie started from the land, building a fixed baseline from the Loch of Stenness in Orkney, laying out a long line across its surface when it was frozen hard in winter. (This was the time of the Little Ice Age.) He mapped out the land with precision, and from that base moved on to chart the sea. He measured the speed of tidal currents by letting himself drift in an open boat, timing with his stopwatch the journey past a fixed distance. He presented his results t the Royal Society in May 1749 and prefaced them by noting that Newton’s theory of gravitational had made it possible for the first time to explain tidal motion. To this, he went on, he had added the effect of ‘land, shoals and wind’. An atlas of his maps was published in 1750 and remained the standard work for mariners until the modern Admiralty chart. Before Mackenzie, some of the finest maps of the north were made by Timothy Pont, an accomplished mathematician from St Andrews University who was minister of the Dunnet Kirk from 1601 to 1610. He produced the first detailed map of Scotland, visiting every part of the country to make drawings and measurements. His maps are amongst the earliest surviving to show a European country in minute detail. With its rich mix of history and geography and wildlife, the Dunnet area is being highlighted by the Dunnet Head Educational Trust.